With Valentines day just a week away, I thought i'd continue the Valentines content with a makeup look of some of my current favourite products from mainly the high street, in order to create an easy Valentines date night makeup look with that any one could pull off. A few of these products I have previously featured in my New Year Beauty Picks, and since then i've continued to use and love these products even more. 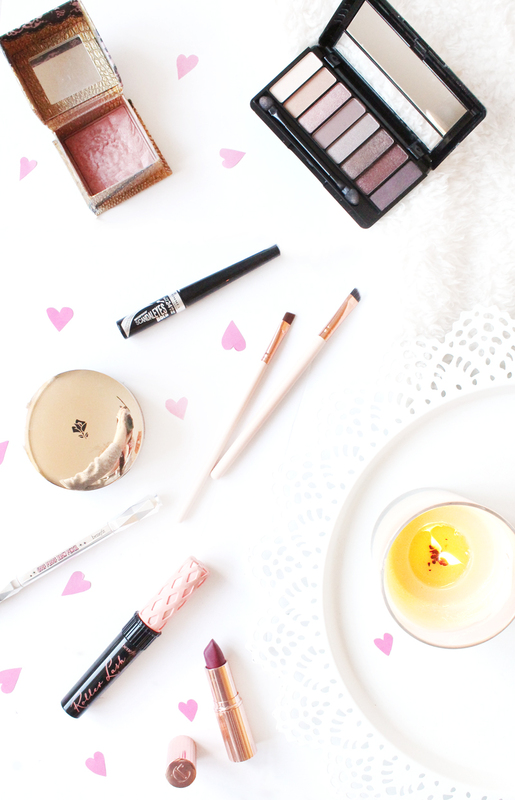 Being the total budget kind of girl that I am, I always prefer to feature my favourite drug store/high street makeup because lets face it, some high street makeup brands are absolutely killing it. Also being on a spending ban, means if you too are on a budget these products aren't going to break the bank when it comes to making yourself look all pretty for Valentines, but i've still got a few higher end picks for those of you who prefer your higher end products. Starting with my current go to foundation, which is the Lancome Tient Idole Cushion Foundation* (£30) which I personally love for how light weight this foundation is yet the coverage rivals some of my favourite drug store foundations. I typically save this foundation for more of an evening/special occasion, as I would just use up the product so quickly if I were to use it on a day to day basis, but if you haven't tried any cushion foundations then i'd definitely recommend trying this! I've fully reviewed this foundation, so if you want to read that then check out that post here. For blush i've been loving, and have been for months (let's be honest) is the Benefit Rockateur Blusher (£23.50) which is the most beautiful rose blush with a gold shimmer undertone that looks absolutely stunning on the cheeks. Also from Benefit is my go to Goof Proof Brow Pencil (£18.50), which makes my brows look absolutely unreal! If you're wanting a new brow pencil, then i'd definitely recommend checking out Benefit's brow range if you haven't already! Finally from Benefit we have probably the best mascara that i've tried, that just instantly makes your lashes look unreal. This is of course Benefit Roller Lash (£19.50), which makes your lashes look super curled and really long which is great if you hate wearing false lashes like me. Moving onto the eye look, and one of my favourite palettes is the Rimmel Magnif'eyes Eyeshadow Palette* (£7.99) which is a really pretty palette with pink, purple and matte shadows that are just so pretty for Valentines! I personally love mixing the mauve shades to create a different eye look to my normal gold/bronze eye look, and I absolutely love the consistency to the shadows. If you're wanting a new eyeshadow palette with a select few shades that all work together, then definitely check out Rimmels palettes. Another product from Rimmel that has become my go to eyeliner is the Rimmel Scandal Eyes Eyeliner* (£5.29), which is different to any eyeliner i've ever used, mainly because the applicator has an odd ball on the end of the applicator. To begin with I really wondered how that benefited a precise flick, however i've managed to master my flicks so well with this and the super black formula lasts so well! To finish off my Valentines makeup picks, I couldn't not include Charlotte Tilbury Love Liberty Lipstick (£23), which is my favourite go to berry red shade as i'm not a true red lip kind of gal. To be honest, any lipstick from Charlotte Tilbury would just finish this look, especially as she has released some beautiful shades recently so you're definitely going to find a shade you like!